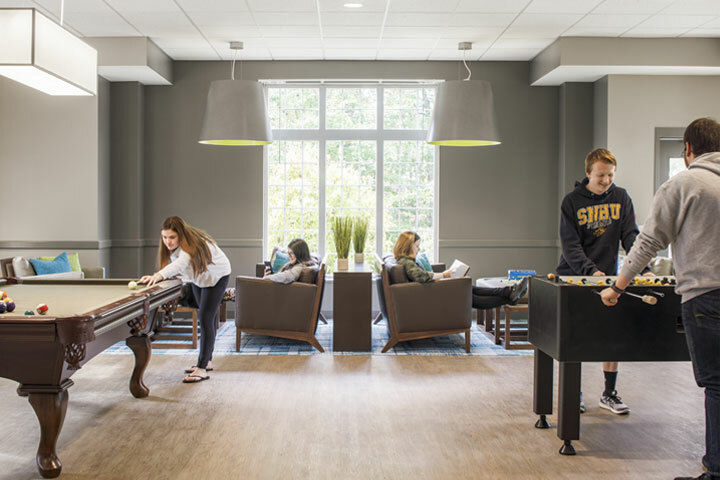 Vibrant Communal Spaces: SNHU Windsor & Hampton Hall - Lumetta, Inc.
After successfully transforming Southern New Hampshire University’s (SNHU) decommissioned library into a vibrant student center, Analogue Studio was tapped to revitalize the outdated residence hall of Windsor & Hampton. 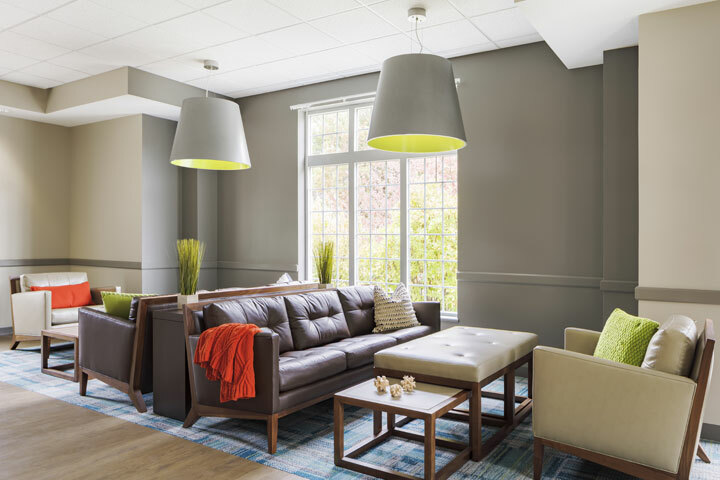 Originally designed to promote community by combining compact residential suites with shared lounge spaces, they were shunned by students in favor of their bedrooms. This undermined any sense of community. Poor lighting, drab finishes, and uncomfortable furniture had to go. Analogue Studios’ Design Team composed of Brian Amaral, Matthew Morse, Vince Pan, and Stephanie Collins set to renovate these drab common spaces. 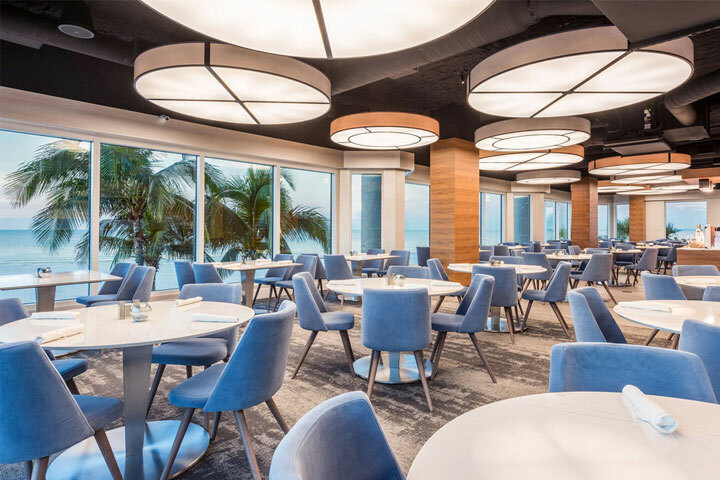 Utilizing the right mix of inviting furniture, vibrant finishes, residential accessories, warm flooring, and stylish LED lighting, the spaces transformed into a communal living room. 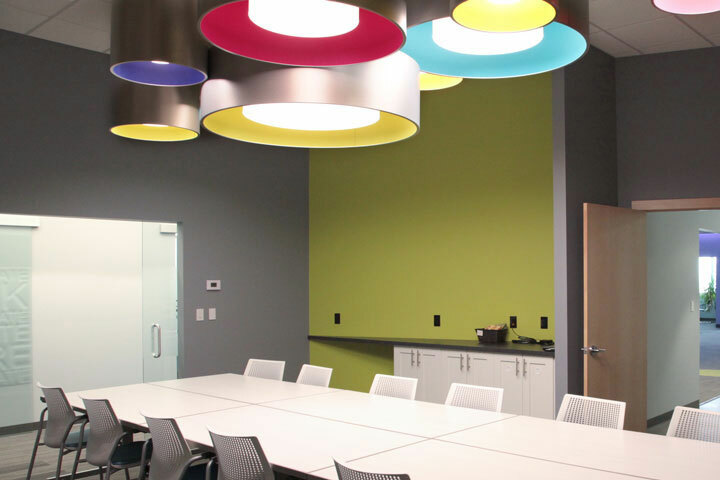 In the Game Room shared by the entire building, they appointed a combination of Lumetta’s 48” streamline and 32” L2 pendants. Opting for simplicity, the streamline was chosen in shade D148 Mist from the Lumenate® Weave series. The L2 taper sports D148 Mist on the outer shade with D57 Apple inner shade from the Lumenate® Fresh series. Exposure Lighting is the preferred agency for this project. This article is based off Analogue Studio’s architecture + interiors feature, written with permission. 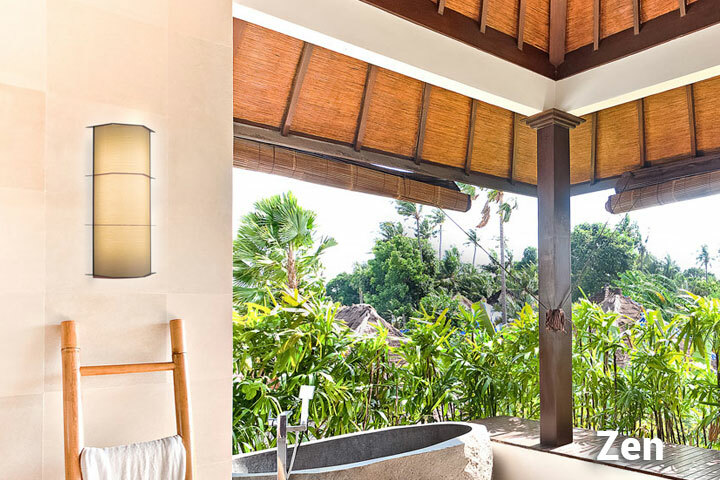 Unobstructed floor-to-ceiling beach views with custom drum pendants. A Cluster of L2 Acoustic for Isted Technical Sales’ Conference Room.